Welcome Topher Scott To The Prodigy Team! Before we let Topher tell you bit about himself and his journey, we’d like to say how excited we are to have such a great person and hockey coach on our staff. Topher brings a wealth of knowledge and leadership that will benefit Prodigy in a number of areas. You’ll see immediately the passion he has for hockey and the type of asset he will be for your development as a coach or player. I have been extremely fortunate for the people that I have been surrounded by throughout my life. I have had unbelievable role models, coaches, teachers, teammates, co-workers, friends, and family. Growing up (age-wise, not height-wise) I had a lot of incredible people in my corner. People showing me the way. People lifting my spirits. People holding me accountable. People telling me “yes”. People telling me “no”. People inspiring me to be the best and to follow my dreams. I was blessed with some pretty unique talents, but my incredible influences are the reason I am where I am today. Certainly in life, but what I want to write about pertains to my love of hockey. My dad played and coached. My uncles played and coached. My grandfather started a AAA organization. The other one was a referee and froze his backyard every winter for us (AWESOME). I had coaches at the youth levels who played in the NHL. I had teammates that went on to be stud college and NHL players. And I had a family that made sure I kept my head on straight. I think it is easy to say that I was put in a position to succeed. The hockey world is extremely small, and the network of the people in my corner helped to guide me to the right places…and the right people. Sadly, too many kids growing up loving the game today aren’t blessed with the same support system that I had. They are often steered to make decisions by the wrong influences, as there are too many people in our game that have figured out the money they can make by exploiting these kids and families who are unfamiliar with the developmental process. At the end of the day, families want what is best for their kids. So they will go to the ends of the earth to guide them to that point. Unfortunately, many of these families are getting the wrong advice from the wrong people on how to get there. Seriously though. That is what I’m going to be doing. And it’s going to be awesome! Brian Keane with Prodigy Hockey is an awesome hockey mind and along with a team of a few other people, we are going to take the hockey world by storm by educating players, parents, and coaches about the right way to approach development. Brian has already done an amazing job on the site with features like personalized video analysis, skill drill implementation, and teaching videos through the analysis of pro hockey players. He has made the game better with the players that he has worked with, ranging from the youth to NHL levels. 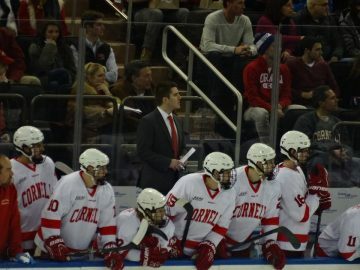 I will look to add value to this team by bringing ideas that are near and dear to me: Leadership Development, Service Opportunities, and educating people on the process to college hockey. We’ll hold leadership seminars for coaches and players. We’ll provide opportunities for players and teams to get involved in service causes. We’ll have more videos that will teach the ins and outs of the game of hockey. And we’ll have a team of former pro and college hockey members that can answer families’ questions (unbiased and FREE through email) about the path to college or professional hockey. I believe in the power of giving back. There are so many people in my life to thank for where I am today and the milestones that I have been able to reach. Without these incredible people that had my back, there’s no way I would have accomplished the many goals that I set. So with Prodigy Hockey I plan on giving people who weren’t as fortunate as I was the guidance for the opportunity to reach their hockey dreams, and the resources to grow as a player and a person. Along with Brian and our team, we want continue to grow the game and steer it in the right direction. We want to help players develop the skills necessary to succeed both on and off the ice. We want to help families navigate the craziness that is the youth hockey experience. We want to help coaches by giving them more tools to be able to further develop their players. And we want to give back to the game that has given us our lives. I am super excited for this next step of the journey, and thrilled to join this amazing new team. Here’s to hockey! !